Cheese feminized seeds are a very popular kind to grow because of its great yield, beautiful thick heavy buds and a smell/taste to die for. First of all it's really important to use a good air filter when you grow Cheese indoor and the smell can be a real "give away". Her mixture of Indica and Sativa provides a body buzz stone together with an elevating high feeling you can hang on to for a while. Indica properties give her a bushy appearance so it is wise not to plant them too close next to each other. The buds grow thick and heavy with a nice looking layer of resin with hairs that are colored yellow to golden orange. It is ideal for beginner growers because of her "easy" growing properties and great yield. 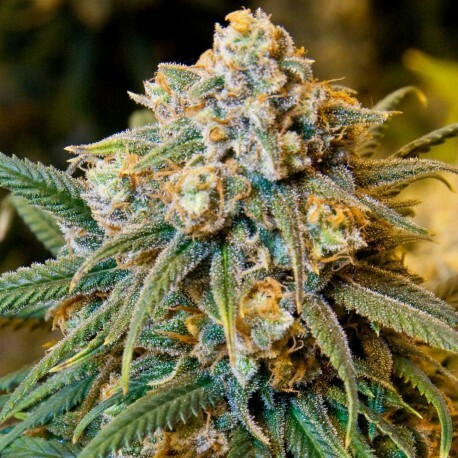 Cheese is a very popular and unique feminized marijuana strain. It is named so due to its very distinctive cheesy aroma. It has a very appealing fresh fruity odor, highly pungent and provides an uplifting effect. The feminized version retains the taste and flavor of the original Cheese, while it also consistently produces a much better yield that the original strain. This seed strain grows into a more controlled cannabis plant with larger buds. It has a highly dominant, deep earthy flavor and produces a giggly happy high in addition to a powerful pot. Cheese feminized seeds require around eight to ten weeks for blooming. The indica sativa ratio is 60% and 40% respectively. The taste and smell of Cheese feminized are enhanced, but the high remains the same, and you get a kickass high every single time. Experienced growers advise to use a good quality air filter when you cultivate this variety indoors because the smell can be a true give-away. The body buzz stone that it produces is combined with an elevating high feel that smokers can hang over for some time. The buds of this strain grow heavy and thick with a nice resin layer with yellow to golden orange hairs. The awards and accolades that Cheese feminized has won substantiate that its recommendations are justified. It has won the Best Indica cup twice and Cannabis cup once. On the whole, it’s an ideal choice of feminized seeds for beginners due to its easy cultivating properties and high yield. High Supplies is the best online supplier of all kinds of cannabis seeds at highly competitive prices. i have been growing a long time and this plant is a very special one, a definite must have. Never seen such goodness, wow the best Ive ever seen. I am now a true customer.